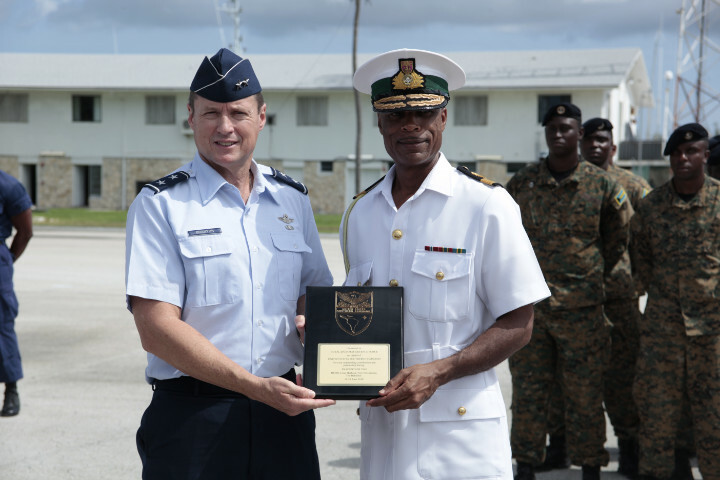 Colonel Thomas Bright, U.S. (representing Terrence O'Shaughnessy, Commander, US Northern Command), presenting Commodore Tellis Bethel, Chief of Defence Staff for the Tradewinds CARICOM Task Force with a gift of presentation during the closing ceremony for Exercise Tradewinds 2018. Coral Harbour Base,(RBDF): The Minister of National Security, the Honourable Marvin Dames, expressed profound thanks for the United States Government's sponsorship of Exercise Tradewinds, the largest annual regional event of its kind that promotes Caribbean Security among partner nations. In his remarks at the closing ceremony for Exercise Tradewinds 2018 at Coral Harbour Base, Minister Dames emphasized the importance of training together as a unified body. “Over the past 3 weeks, this exercise has also strengthened the strong bonds of security cooperation that exist between regional and international partners at the operational and tactical levels”, said Minister Dames. “This bond is vital to enabling our security forces not only to stand ready, but to also stand together in securing our borders”. Remarks were also brought by Major General Robert M. Branyon, Deputy Commander for Mobilization and Reserve Affairs for the United States Southern Command, who represented Admiral Kurt Tidd, the Commander, US Southern Command. Major General Branyon stated the positive outcome of a cohesive unit. 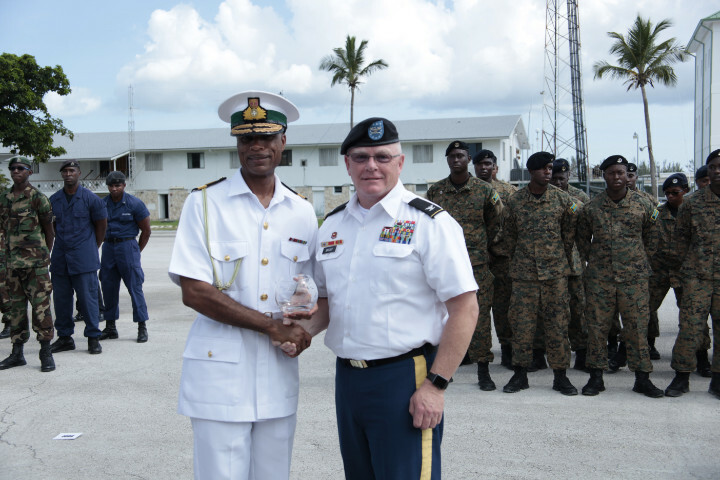 Major General Robert M. Branyon, Deputy Commander for Mobilization and Reserve Affairs for the United States Southern Command presenting Commodore Tellis Bethel, Chief of Defence Staff for the Tradewinds CARICOM Task Force with a gift of presentation during the closing ceremony for Exercise Tradewinds 2018. “When we join together in exercises like this, we learn from one another; we better understand one another, and ultimately we become stronger and more secure together,” said Major General Branyon. “The personal relationships made throughout this exercise binds us together, not just as security professionals, but really as equal partners and true friends”. In expressing his appreciation to coordinators, partner forces, planners and participants for making Exercise Tradewinds 2018 a great success, the Commander Defence Force, Commodore Tellis Bethel, stated that the event provided the Royal Bahamas Defence Force the "opportunity to train with foreign security forces of partner nations on the home front,” in addition to allowing the Defence Force "to extend an invitation to our Bahamian law enforcement partners to train together" for the purpose of enhancing regional security. The ceremony on June 21st was the culmination of more than a year-and-a-half of planning and 3 weeks of intense training that concluded with the execution of a real-world counter-terrorism scenario conducted by military personnel from over 20 nations. Phase 1 of the training exercise was conducted on the island of St. Kitts from June 4th – 13th, and The Royal Bahamas Defence Force hosted Phase 2 of the exercise from June 14th – 21st, 2018. Other distinguished guests in attendance at the ceremony included Ms. Stephanie Bowers, US Chargé d’Affaires at the United States Embassy in Nassau; Colonel Thomas Bright, U.S. (representing Terrence O'Shaughnessy, Commander, US Northern Command), Honorary Consul members of participating nations, as well as senior military and law enforcement officials from The Bahamas and other participating nations. Nations represented included Canada, Mexico, France, the United Kingdom, and partner nations throughout the Caribbean. 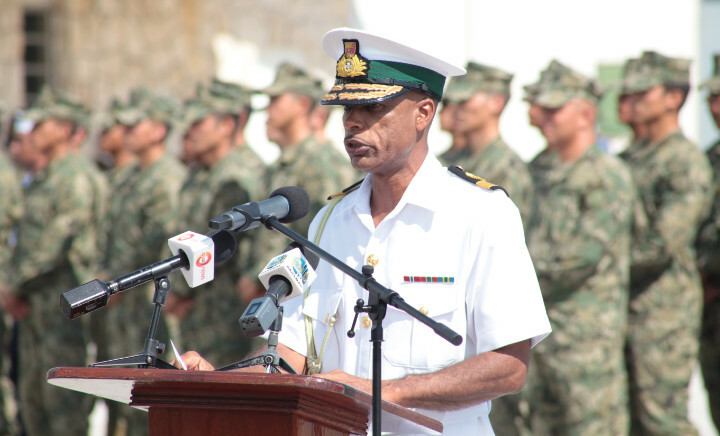 Commodore Tellis Bethel, Chief of Defence Staff for the Tradewinds CARICOM Task Force bringing remarks at the closing ceremony of Tradewinds 2018 at the Defence Force Base on June 21, 2018. Exercise Tradewinds 2018 is an annual US-sponsored regional training exercise that focuses on Caribbean security including disaster relief and humanitarian assistance. This year’s event was centered on countering transnational organized crime. The ceremony concluded with plaque exchanges between Commodore Bethel, as Chief of Defence Staff for the Tradewinds CARICOM Task Force, and Major General Branyon and Colonel Bright of the US Southern and Northern Commands.